It’s just not a pretty building, 250 Spencer Street. It’s hard to believe it was ever considered to be so. The Age is moving this weekend, out of this brown monstrosity and into the new building on the other side of Southern Cross Station. Hopefully the move goes smoothly for them, and the new place ages more gracefully than the old. I wonder how long it’ll take before it’s bought and demolished? Actually, it’s already been sold – end of 2007 I think – and it’s going to be used as the headquarters for the national census. Great storage in the old printing press area for all the forms! Just for once I won’t suggest that the building should be reused and turned into apartments. Did you notice The Age was accidentally published today showing the date 11 November 2009??? Looks a lot like the style of the METROL building they were gonna build in the 80’s. Funny you mention ‘it was ever considered to be so’ … I heard a story somewhere that the Gas and Fuel towers (or Princes Gate Project more officially) were on the front of the phone book in the late 1960s as a prized piece of Melbourne architecture – can anyone verify this?? 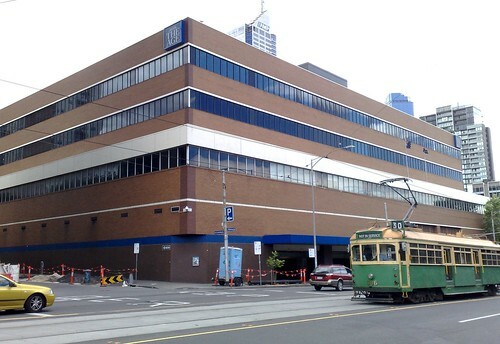 I recall another brown brick office building on the corner of Bourke and Elizabeth Streets opposite the GPO that stood derlict for a number of years before being demolished in the mid 90s for ‘The Pavilion’ although don’t know what was housed there originally. As for the old ‘Spencer Street Soviet’, is it to be demolished for (more) apartments?? Andrew S, yeah I guess another example is the Hilton (Wellington Pde); I suppose it was just the fashion for a while. Quote : “I wonder how long it’ll take before it’s bought and demolished?”. (b)a satellite campus for a something like University of Technology Sydney..now that would be bizarre.